Jotia is a modern neo-humanist created by Rebecca Hurst and published by The Northern Block, a Northumberland, United Kingdom logo and type design studio. 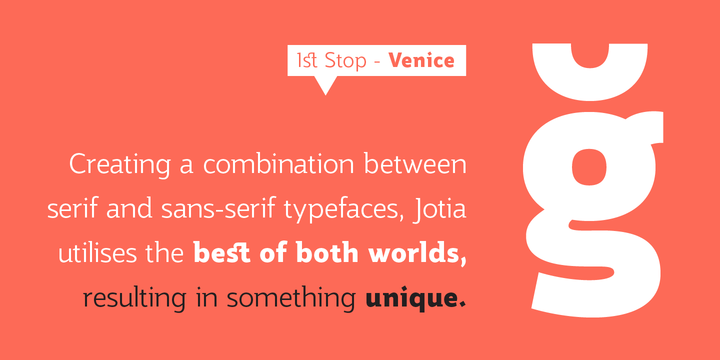 Creating a combination between serif and sans serif typefaces, Jotia features triangular serif shape details, six weights, manual kerning and spacing to create strong and clear legibility. All these features make Jotia work great with complex editorial works. Jotia is powerful and unique! Trademark: “Jotia” is a trademark font name of The Northern Block Ltd.
A font description published on Monday, August 31st, 2015 in Fonts, Rebecca Hurst, The Northern Block by Andrei that has 5,264 views.